CAD–enabled structural steel detailing is the most sophisticated way of developing error-free detailed working drawings of pre–fabricated building components. Steel columns, beams, trusses, stairs, braces, handrails, steel joists, metal decking, and many other large and small steel components are used in the construction of buildings, bridges, airports, and industrial plants. Structural steel detailing helps in creating detailed design plans, structural drawings, and a variety of construction documents for the production and erection of steel members. The complexities involved in defining structural phases and performing construction of a structure accordingly demands precise planning and effective drawing. 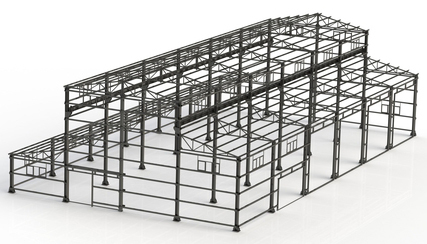 One can easily create a detailed drawing of the entire structure, right from its parts and steel assembly to handrails using CAD–enabled structural steel detailing process. Detailing of all structural elements, including steel columns, metal decking, and erection layout, essential for fabricators helps make an effective estimate of the costs for steel beforehand and generate design plans within the budget. Fabrication drawing, also known as shop drawing, helps define each member placement and material specifications. Structural steel detailing through this type of drawing using latest CAD technologies, such as AutoCAD, enables creation of elaborate patterns that explain design, fabrication, material, and align requirements for each steel element in structures with ease. Arrival of new tools and technologies have reduced time for highly complex fabrication drawings while enhancing accuracy and bringing down errors. Erection drawing used to generate CAD blueprints detailing location and design of fabricated steel erectors. Demonstrating all dimensions of fabricated steel members, these drawings provides precise information on where and how to place steel members during the construction of a project. It includes specific details about welding, bolts, joints, and wedge anchors for steel fabrications. Structural steel detailing has emerged as an essential component of public, commercial, and industrial constructions where steel elements are predominant. Right from industrial structures to residential and shopping complexes, the methods is widely resorted to plan swift and error–free construction work. Manufacturing of heavy machinery, both for civil and military sectors, where steel fabrications play an important role demand structural steel detailing to estimate costs, create designs, and devise production details. Architects, engineers, and fabricators take help of the process to evaluate structural complexities, load, design efficacy, cost, and usage of steel elements. Structural steel detailing is performed by professional experts and with high precision and by. These drawings must be able to define and detail intricate tasks, such as exact size, numbers, material specifications, amount, cost, and dimensions while conforming to the highest international standards, such as AISC, BS, and Australian Standards. The widespread usage of latest CAD technologies and 3D software has improved the quality, speed, and accuracy of structural steel detailing. It has made exact drawings in 3D format has become easy and affordable than complicated manual detailing. Dedicated professionals trained in detailing standards and CAD assures greater precision and faster completion of structural steel detailing.